The Jerusalem Quartet continue to be both regular and popular visitors to major venues throughout the world. With a growing reputation in North America, they have played in venues throughout New York, Chicago, Los Angeles, Philadelphia, Cleveland and Washington. During the 2011-12 Season they also toured the UK in a program of Schumann, together with pianist Alexander Melnikov, celebrating the release of their CD on Harmonia Mundi. Their European concerts have included appearances at venues such as the Concertgebouw in Amsterdam, the Herkulessaal in Munich, London's Wigmore Hall and the Cité de la Musique in Paris. In past seasons, the Jerusalem Quartet concentrated on Brahms’s chamber music with special residencies at the Auditorium du Louvre, Paris, the Hamburger Ostertöne Festival, the Schubertiade and at De Doelen, Rotterdam. Throughout the 2009-10 season the Jerusalem Quartet performed their “Mozart Plus” project at the Wigmore Hall - focusing on String Quartets and Quintets by Mozart - together with violist Lawrence Power. The Quartet toured this program in cities across Europe, including Amsterdam, Rotterdam, Munich and Zurich. The Jerusalem Quartet record exclusively for Harmonia Mundi and their discs have been awarded with numerous prizes. Their recording of Haydn’s String Quartets won the chamber category of the 2010 BBC Music Magazine Awards and the Diapason d’Or Arte, while their release of Schubert’s Death and the Maiden Quartet received an ECHO Klassik Award in 2009 and was featured as Editor’s Choice in the July 2008 edition of Gramophone Magazine. The Quartet’s recording of Mozart’s String Quartets, released in March 2011, was immediately selected as Chamber Music Choice inBBC Music Magazine the same month. Their latest release, a recording of Schumann’s Piano Quartet and Quintet with Alexander Melnikov, was released in spring 2012. 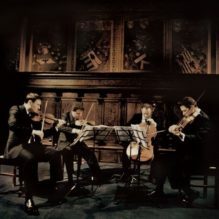 In 2003 the Quartet were recipients of the first Borletti-Buitoni Trust Award. They were also part of the first ever BBC New Generation Artists scheme from 1999 to 2001.